Many thanks to @jdowlo1 of A Peek Inside blog who alerted me to this great website page where kids can create. It's called Comix, and is part of Aven's Corner which has lots of other flash games too. What I like: the interface is simple and well set out and functions are (mostly) logical. 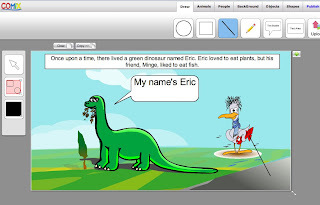 Above your working canvas, you have tabs to choose from : Draw, Animals, People, Background, Objects, Shapes and Publish. Large green arrows help you scroll thorough choices once you pick a tab. There's lots of variety eg 33 pages of animals with around 7 to a page. At the left side of the canvas are three icons that help you move and resize etc, group, or choose colours. Kids could easily just use the tabs and get a satisfying result. What I did: I chose a background, clicked on it to pick it up and clicked again to drop it on the canvas. Then I began choosing animals and people. This wasn't so simple. You need to click on the one you want, then go to your canvas and click and drag that item out to the size you want. It took me a moment or two to get it, but kids no doubt will intuitively manage. Give kids plenty of time to experiment and remind them that's how we learn. And if they work out what the group icon is all about, let me know! 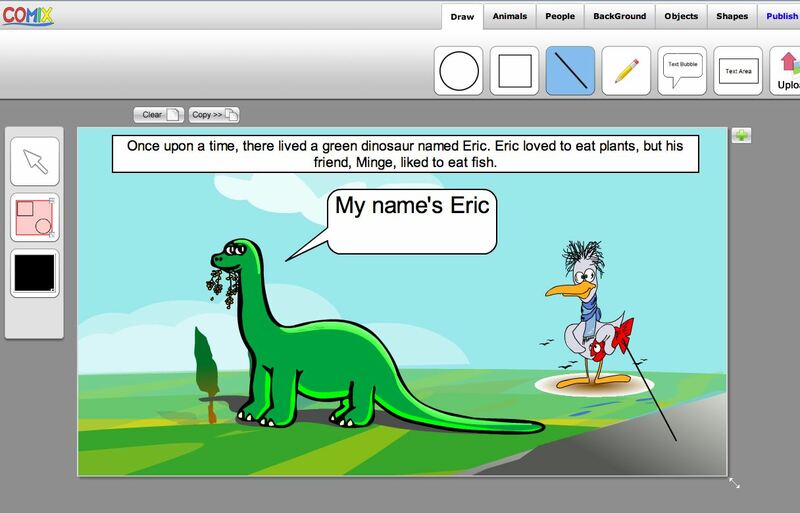 The draw tab lets you add shapes and lines, draw freehand, add speech bubbles or an area of text, and upload pictures. Publish tab offers a print function, save to your computer as a jpg, or publish to AvensCorner.com. I tweaked my simple story in the text box, added speech bubbles and clicked inside them to add text, drew a fish with the pencil, and sat back to regard my masterpiece! 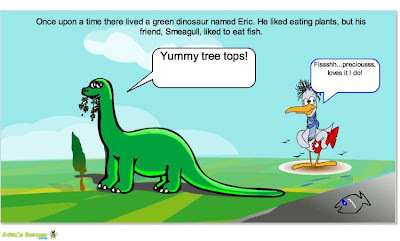 Comix is another interesting alternative for kids who want to create digital stories or just play with words and images. I found it took a little getting used to, but I really like the variety of features and the save options. When write o'clock comes around, why not visit Comix with your kids?